Midfielder Nicola Davidson was delighted with how the younger players performed as Forfar Farmington took all three points in the capital on Sunday. The depleted side won 2-1 against Hutchison Vale with second half goals from Davidson and Kayleigh Noble despite a late consolation from Hutchison Vale. With several players missing, Chelsey Lownie, Alex Russell, Ellice Brannan, Sally Patterson and Cheryl Kilcoyne stepped up from the development squad and the captain reckons it is great seeing them impress. The goalscorer was also delighted with keeper Fiona McNicoll after she pulled off several fantastic saves to deny Hutchie Vale. It was a return to league action for Damon Neish’s squad after a month’s break and it was an uphill task after five regular starters were unavailable. The aforementioned development players came in, with Brannan and Lownie starting and the other three on the bench. A scrappy opening saw Vale’s Laura Gavin fire at McNicoll while Laura Parsley and Keira Johnstone both saw chances saved in the opening ten minutes. Johnstone had another chance eighteen minutes in after excellent work from Lownie but she was offbalance when she took the shot and it was easily gathered by Laura Connolly. Hutchie had efforts of their own through new signings Hayley Cunningham and Elliss Jenkins, neither could find the target though. Both Johnstone and Lownie were combining well up front and went close yet again, the pair firing straight at Connolly in quick succession before Lownie hit the side netting from a Burns long ball. Cunningham forced a good save from McNicoll on the stroke of half time but the sides finished the first half goalless. Forfar kept hunting for that elusive first goal with Lownie yet again going close, captain Davidson also seeing a long range shot sail inches over the bar. McNicoll had two excellent saves again in quick succession just after the hour mark; the second of which saw the ball spin towards goal but defender Gemma Collier raced back to clear off the line. Davidson saw a free kick pushed away in the 65th minute before Jade McLaren nodded Noble’s corner wide. Three minutes after her first set piece, Davidson went one better and curled another free kick into the top corner to open the scoring from twenty yards. With thirteen minutes left Forfar doubled their advantage, a long ball from McNicoll deceived everyone, including the Hutchie keeper and Sally Patterson raced in to collect the ball before cutting it back for Kayleigh Noble to bundle home. McNicoll had yet another great save from Vale captain Gavin but was unable to stop Cunningham’s free kick two minutes from time. Forfar kept the lead until the final whistle and went home with a vital three points, the side now looking ahead to next week’s clash with Inverness City at Station Park with a 2pm kick off. Iain Campbell’s deflected free kick ten minutes from time was enough to put Forfar into the next round of the Petrofac Training Cup after a stuffy game with fellow Angus side Montrose. Forfar hit the bar through Craig Smith and also had the ball in the net but Michael Travis’ shot was ruled out for an apparent foul on the Gable Endies keeper. The Loons fielded three of their new signings, Thomas O’Brien, Kevin Nicoll and Iain Campbell while Bryan Hodge had to be content with a spot on the bench after missing most of pre-season with a broken nose. Craig Smith was rewarded for his pre season form with a start up front alongside captain Gavin Swankie. A dull beginning to the game saw little happen until the 23rd minute when Swankie and Campbell exchanged passes before the captain swung a cross in, a deflection took the ball towards Jordan Miller in goal but Michael Travis snuck in and slotted home. The referee disallowed the goal for an apparent foul on Miller but it didn’t seem like he had control of the ball in the first place. Montrose threatened at the other end three minutes later after former Loon Andrew Steeves’ cross was knocked to the edge of the box by Dale Reid but Ross McCord’s effort was blocked before it could reach Rab Douglas. On the half hour mark Danny Denholm played a ball forward for Swankie who chested it towards Gavin Malin but the attacking midfielder was unlucky not to reach it and the threat was nullified. Travis nodded a Campbell free kick at Miller while former Forfar striker Gary Fraser struck low straight at Douglas as both sides tried to break down either defence. Fraser and Craig Smith both had efforts blocked on the stroke of half time. The second half was quieter than the first but the first opportunity came just six minutes in when Swankie was set up by Kevin Nicoll but he pulled his effort wide. Campbell set up Smith with a free kick two minutes after and the youngster saw his shot saved after a stramash on the line. Just before the hour mark Forfar brought on Chris Templeman and Bryan Hodge for Malin and Denholm and the subs, especially Hodge seemed to energise the side and they went the closest they had to scoring a goal three minutes after bringing them on. Swankie swung a free kick from the corner of the box into the area and the ball was met by Smith, his header crashing off the bar, the ball wasn’t cleared and O’Brien had a follow up effort saved. The Loons then brought on Kerr Hay for Smith with twenty minutes left. In the 72nd minute Hodge saw a shot take a deflection off Templeman before being smothered by Millar. Forfar took the lead with twelve minutes left after Swankie was fouled on the edge of the box by Terry Masson, Campbell stepped up to fire the free kick home through the Montrose wall, his effort taking a nick off a defender before going in. The home side looked to kill the game off after this and four minutes after going ahead, they almost went two up with a great counter attack. Swankie sent the ball down the left for the pacy Hay to chase down and his cross was met by Hodge but he could only stab the ball into the side netting. Swankie and Templeman had shots saved in the 84th minute before the sub saw a header at the far post caught on the line by Millar. The Gable Endies desperately hunted for a goal in the dying stages but despite shots from Scott Johnston, Ryan Ferguson and Ross McCord Forfar held on to progress into the next round. Forfar Farmington prepared for the second half of their Scottish Women’s Premier League season with a comfortable 7-2 win away to First Division side Dunfermline Athletic. A hat trick from Kayleigh Noble along with Keira Johnstone’s double and goals from Nicola Davidson helped the side in their final warm up match before Sunday’s trip to Hutchison Vale. Head Coach Damon Neish drafted in two players for the game, with Jade Logan coming from the Ladies squad while Joanna Collier played her first game for the club in two years after a spell out of the game. Forfar started off strongly with Noble firing wide four minutes in after Lindsey Dunbar’s work. The winger put Farmington ahead three minutes later, forcing a Napier cross home; Keira Johnstone heading the ball to the back post for Noble. Less than sixty seconds later Johnstone doubled the lead, the on fire striker slotting home for her fifth of the week after she had netted four for the Scotland CYP squad on Sunday. Farmington looked to threaten even more in the opening 45 on a less than average pitch and went close through vice captain Napier three times and Noble again. The winger added her second of the night seven minutes from half time, the impressive Sophie Milligan swung in a cross that Noble met with a goal bound effort, it did eventually go in albeit via two deflections. Four minutes into the second half the Pars pulled a goal back in their first effort of the game but the three goal advantage was restored a minute later when Nicola Davidson netted from 35 yards, a regular distance for the veteran’s goals. In the 59th minute Dunfermline grabbed a second after lobbing Fiona McNicoll, but like with their first goal, Forfar scored sixty seconds after through Johnstone for her second of the game. Milligan almost set up another goal in the 72nd minute with a defence splitting pass that Napier raced on to before blasting over the bar. It was six for Forfar soon after through Noble, collecting the ball from a hard working Dunbar before slipping it under the keeper for her hat trick. 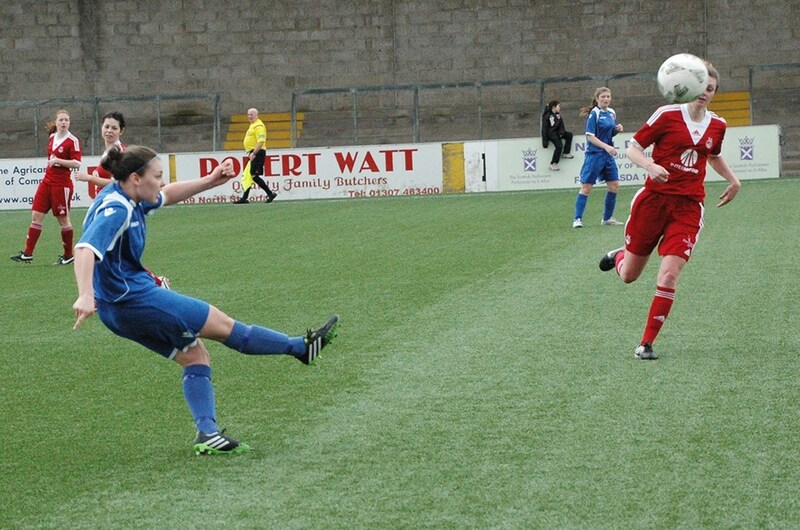 Like Milligan, Megan Burns was having a good game at left back, and in the centre of defence in the second half. She won a free kick in a dangerous position after a fantastic run weaving through the Pars midfield; the set piece from goalkeeper McNicoll was poor and hit the wall. Napier went close again with another two chances late on but eventually netted three minutes from time, running into Milligan’s through ball and gleefully slotting home. The game was a good fitness test for the squad ahead of Sunday’s game where they will miss Amy Gallacher, Derrian Gollan, Napier and Milligan. Fiona McNicoll, Sophie Milligan, Megan Burns, Jade McLaren, Nicola Davidson (Joanna Collier 59); Lindsey Dunbar, Joanna Collier (Jade Logan 46); Kayleigh Noble, Holly Napier, Derrian Gollan; Keira Johnstone. A mixture of Forfar Farmington’s Premier League, Development and Ladies squads defeated Tayside Ladies 7-1 at a sunny Station Park this afternoon, in what was a good bounce match for both clubs. A double from Chelsey Lownie and a Kayleigh Brough header had the team three up at half time before Lownie completed her hat trick in the second half, along with goals from Holly Napier twice and Derrian Gollan while Ellie Scanlan netted the Dundee side’s consolation. Forfar started off well and went close just four minutes in when Holly Napier fired wide from the edge of the box before the visitor’s Natalie Cromar sent her effort the wrong side of the post from a tight angle five minutes later. Just ten minutes into the friendly, Farmington took the lead, the development squad’s new signing Chelsey Lownie did well to get the ball from a Tayside defender and the keeper before slotting home into an empty net. Napier then sent a free kick inches over the bar with each team starting to settle into the game. In the 26th minute Nicola Davidson hit the post from a Beth Shillitto corner, although Forfar did double their lead from a corner two minutes later, Kayleigh Brough rising to meet Kayleigh Noble’s set piece for her first goal since moving up to the Premier League squad, coincidentally, just before she moves across to America. Lownie then made it three with her second a minute later as Forfar looked the more dangerous side with Chloe Sturrock, Shillitto and Lownie all going close before half time. Tayside had their own chance before the break with a long range effort that Hannah Dryden pushed away. After six changes at half time for the home side, it took them a bit to get settled again and Tayside almost capitalised on that, seeing a shot hit off sub keeper Rachelle Milton before it was cleared. Lownie and Napier combined in the 50th minute to set up Derrian Gollan but her effort was saved before Napier was sent clean through on goal, sending her effort wide off the woodwork after thinking she had been called offside. Napier did find the net on the hour mark, racing into the box to meet Gollan’s cut back. Tayside did pull a goal back after 66 minutes, Ellie Scanlan forcing home a loose ball in the six yard box after a corner wasn’t dealt with. Within ten minutes Farmington had netted another two goals, Gollan rounding the keeper before netting while Napier set up Lownie, who squeezed past two defenders on her way to slotting home. Laura Parsley had an effort saved by Chantelle McKay as the game entered the final ten minutes, Lownie also firing wide. Fellow development squad signing Kathryn Pender was unlucky not to net in her first game as well as Lownie, the right back driving forward from her own half with the ball, exchanging passes with Parsley in the middle of the Tayside half but her 25 yard effort was tipped wide by McKay with the effort looking like it would go in at the top corner. Chloe Sturrock then put a shot over from Napier’s corner with Napier finishing the scoring in the 89th minute, gathering Gollan’s pass before sending the ball into the bottom corner. The game looked to have been a good exercise for players of all clubs, with the Premier League season starting again next week, Forfar away to Hutchison Vale. The SWFL season begins the week after and it is a local derby, Jeff Rioch and David Cattanach’s Development side entertaining Colin Brown’s Ladies. Forfar Farmington under 17’s captain Erin Thomson was gutted after suffering a knee injury last month which has ruled her out for at least a year. The 15 year old attacker was injured in training last month and also underwent surgery at the end of June, with another scheduled for August. It is the second knee injury in three months at the club after the Premier League side’s Sydney Cairns tore her ACL as well as the inside and outside cartilage in April. Erin suffered a ruptured anterior cruciate ligament and torn medial and lateral meniscus. Her first operation, at the end of June, was to remove the ruptured ACL and to stitch both menisci meanwhile her second is to reconstruct the ACL with a graft from her hamstring. Despite the injury, Erin feels her side’s season has gone well so far, having made the step up from the under 15 level with the majority of the squad still fourteen or fifteen. Thomson has chipped in with a few goals and assists with the side currently fourth having only lost twice and made the League Cup final recently, being edged out 3-1 by a strong Hibernian side. As was mentioned above, SWPL player Sydney Cairns suffered a similar injury earlier in the year, the sixteen year old successfully went through her ACL operation at the end of June and is now on the long road to recovery. Forfar Athletic defender Thomas O’Brien said he joined the club after being impressed by what was said by other players. The former Cowdenbeath man was speaking after Saturday’s 1-1 draw with East Stirling, in which Derek Young netted the opener, and the 23 year old believes the side can go on and win promotion this season as well as saying how Cowdenbeath was one of the first games he looked for on the fixture list. Forfar were missing seven senior players for the game on Saturday, with Rab Douglas, Mark Baxter, Iain Campbell, Bryan Hodge, Martyn Fotheringham, Danny Denholm and Chris Templeman all missing through injury or holidays. Only four subs were named, James Yates, Jack Neave, Frankie Devine and a trialist keeper meanwhile Jason King was in goal from the start for his first senior game. Forfar started off the better team and had the first chance in the sixth minute when Craig Smith nodded a Gavin Malin free kick past the post. Four minutes later Kerr Hay saw his header saved after rising to meet Michael Travis’s pinpoint cross. East Stirlingshire had their only shot of the half in the fourteenth minute when Ross Gilmour fired over from the edge of the box. The Loons took the lead three minutes later when Gavin Swankie blocked a clearance on the byline, Craig Smith held off his marker to set up Derek Young, who fired the ball home from twenty yards. The first half turned into a drab affair, with the only efforts of note were Swankie and Malin’s shots from an angle being blocked by the visitors trialist keeper. The second half was as exciting as the first in that there was just one goal and very little goalmouth action. Four minutes in Kris Faulds saw a shot blocked before substitutions started to disrupt the flow of play. In the 64th minute Gavin Swankie went close with a free kick but could only hit the post meanwhile at the other end East Stirlingshire equalised after Wallace was fouled by O’Brien, Faulds stepping up to fire home the penalty with King unlucky not to save it. Craig Smith hit the sidenetting with an off balance shot in the 76th minute, before the goal kick was taken a familiar face took to the field for the visitors, former Loons player and manager George Shaw came on as a trialist, although Shaw is Shire’s assistant. In the final moments of the game Connor Greene headed over for the away side while sub Frankie Devine had a shot blocked for the Loons after being set up by Derek Young as the game ended all square. 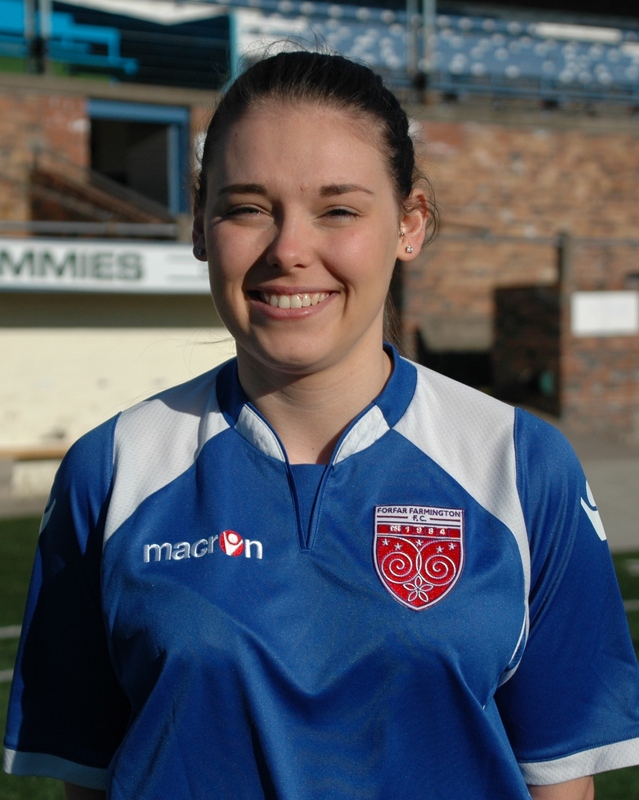 Forfar Farmington defender Sophie Milligan is pleased with how her first full season at the club is going so far. The 22 year old joined the club in September last year but only made two appearances before the season finished while she has played ten times so far this season, missing just two games. After several good performances and two wins in a row, including a four nil win over Hutchison Vale last week, the Scottish Women’s Premier League has broken off for four weeks with the league splitting into two groups of six, despite this Milligan believes there side are now getting the positives results they deserve. The league starts back on July 26th and Damon Neish’s squad travel to face the side they beat before the season had the break, Milligan revealed will miss this and the following game. At the end of the season, the SWPL and SWFL will undergo reconstruction with an SWPL1 and SWPL2 , both having eight sides, in an attempt to make the league more ‘competitive’. This mean four sides will be relegated from the current SWPL but despite it being more difficult to stay up, Sophie reckons the club has what it takes to stay up.